S&R -- Now in Imus! Just days prior to the closing of 2014, S&R Membership Shopping warehouse opened its 9th branch in the country at Imus, Cavite last December 20. I'd say, there is no better timing to open a store than before Christmas when everybody is anxious about what goods to hoard for noche buena a nd the not so distant New Year celebration. Cavite is highly dense with a population of over 3 Million exceeding even Cebu's over 2 Million as per survey taken by NSO in year 2010. That data alone provide enough reason for the establishment of a new S&R warehouse. The new site looks pretty much like S&R Cebu (which I frequently visit) except that its Membership counter has chairs lined up for the waiting guests. As expected, it has the famed Food Service section which offers authentic New York Style Pizza, Southern Style Fried Chicken, The Cheesecake Factory goods and Blue Bunny ice creams. The dining area is right in front of the Food Service counter. Their grocery shelves contain crates of imported products which aren’t easily found in other establishments. Wheel your way (using the grocery carts) through the aisles between the tall stacks of products and you will find yourself grabbing more than a single item. I am certain that the Cavitenos will patronize the warehouse. Other than local residents, Cavite has also become home to tourists who come to this part of the country either for short or long visits. Destinations such as Mt. Pico de Loro and Mt. 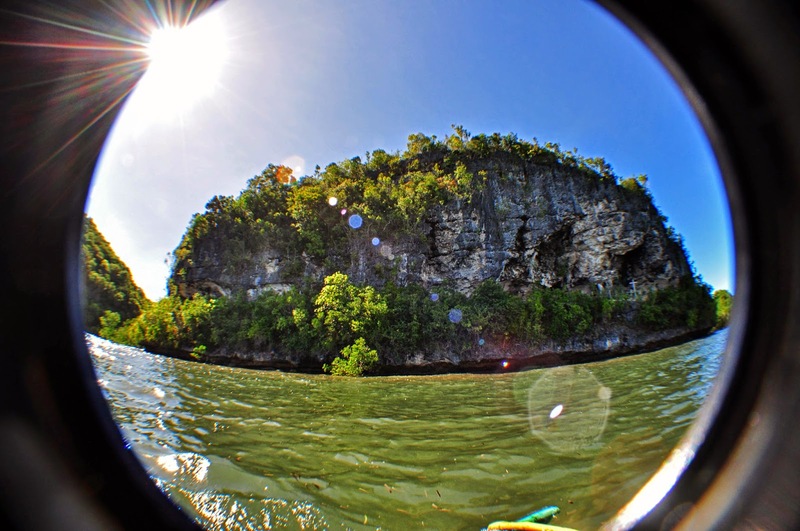 Marami lure outdoor adventure seekers. Historical places like Corregidor, Aguinaldo Shrine, and Andres Bonifacio’s house have its own shares of foreign visitors too. When they go to S&R Imus either as a member or a guest, it will be like home away from home for them. Do you go home to Cavite? If yes, be an S&R member now! Present a valid ID, a filled out membership form (available in S&R's membership section), and membership fee. Get your card in less than 15 minutes. For more information, visit the membership page in S&R's website. Like their FB page. Time for an S&R Holiday Feast! Who would not put their hands up on a pizza that was more than twice the regular of common brands? I could barely even carry the whole box in one hand. I had no choice but hold it like a big tray. It felt heavier by the minute so I either had to put down the box or let the edge rest on my paunch a little bit while I hold the far opposite side with fully extended arms. Nobody gets underserved with S&R’s Holiday Feast! For only P999, you can already have the pizza with 6 large Southern Style Fried Chicken cuts and three 22 oz sodas. You fall in line at the Food Service counter when you order. Sometimes the line is long because of large following but it kind of serves the purpose of building up the craving for the food item you are buying. The pizzas are served fresh from the oven and so are the chicken from the fryer. When they called my number, I rushed to the Claim section to fetch my S&R Holiday Feast. Sporting a broad smile I held the boxes on shoulder level and smelled the exciting aroma of burnt cheese and spices. 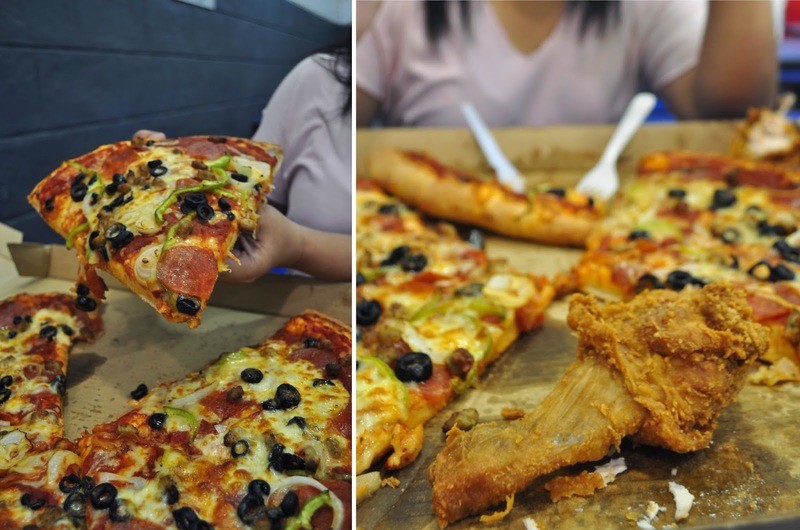 It was my first S&R pizza and I was flabbergasted to see such beauty – colorful like a Christmas tree! Cheese and tomato sauce spread evenly on the crust made beautiful background to meat, pepperoni, capsicum, onion and olive toppings. I asked my friend to hold a slice but there was no way she could hold it on one hand without it drooping. So, there you go -- a pizza slice on two hands for the camera! The crust was cooked the way I liked it: chewy and full. 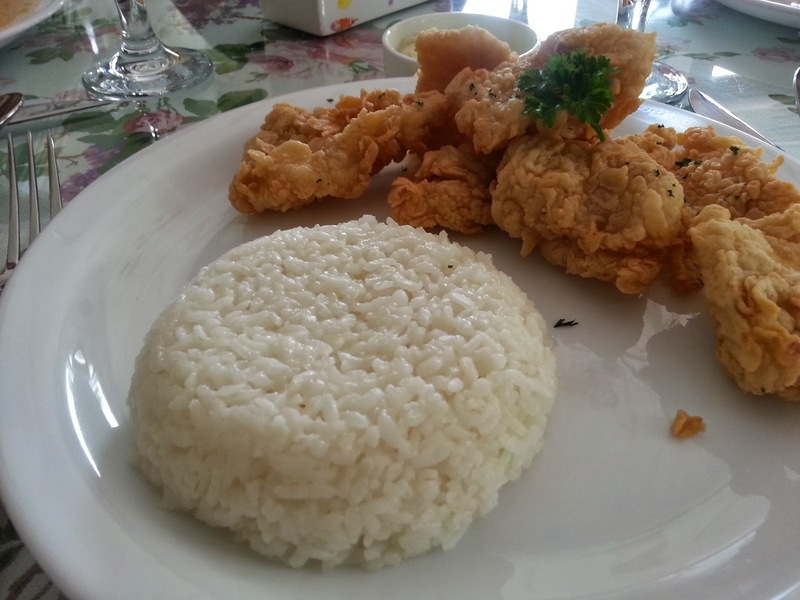 The fried chicken was crispy on the outside, juicy and flavorful inside. What I loved best was its moderate batter coating. Most fast-foods have too much. Like a hungry glutton on a feast, I chomped, held a pizza on one hand and fried chicken on another. I wish we had the appetite of Americans so we could finish everything. Although I started convinced that I CAN – I ended up surrendering with plenty of leftovers. It was very delightful and literally a feast. We left the shop satisfied and I had plenty of extras that can feed me for several days more (me, thinking greedily). While we walked to where the taxis were, we passed by a family, a lady, and a man holding a plastic bag. As much as I wanted to keep the food for myself, I eventually gave all of it to them. After all, it’s Christmas! A term in Philippines fondly used referring to a person survived by collecting garbage. So, why wait? Go get yourself and your friends S&R’s Holiday Feast today! Promo ends on December 31, 2014. Not yet an S&R member? Don't worry. It's easy. All you need is a valid ID, a filled out membership form (available in S&R's membership section), and membership fee. Get your card in less than 15 minutes. Trust me. I just became a member myself. We had plenty of rain due to typhoon "Ruby" but it is still raining "discounts" in S&R shopping center! There is high demand for practicality and frugality ever since people learned about the greenhouse effect and the reality that the things we enjoy today are not eternal. Even the idea of death presents the need for people to stay healthy and exercise to live longer. 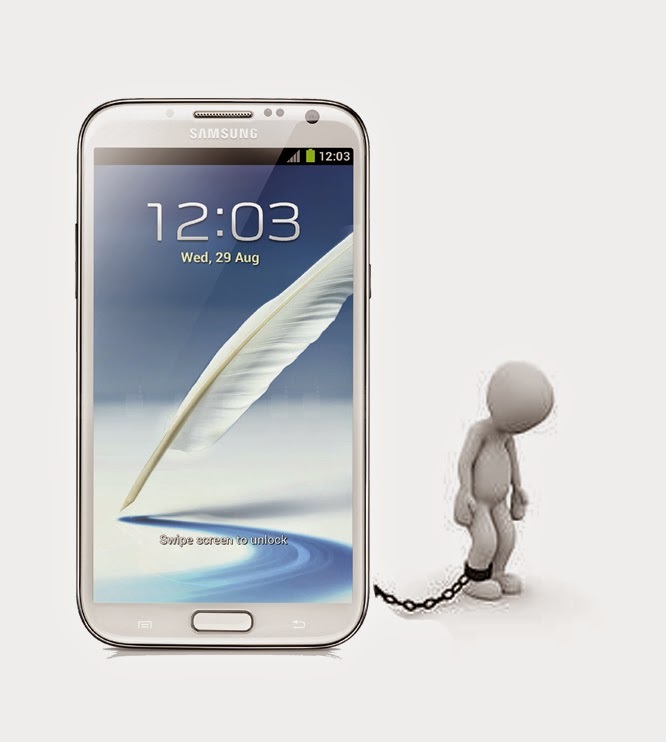 Hence, we are gradually becoming more and more conscious of the value of the things we possess. Since not all things are enjoyed for free, we find better ways to extend the value of money. Discounts! Buy 1 take 1! Free! Great value! These are words and labels which top the results when we run our mental search engine looking for a certain item in a grocery or department store. Sometimes we scavenge through a mound just to find the discounted item because they become out of stock too fast. Not so much at S&R. There is always enough items tagged with an "S&R Club Pricing" logo for members. Hot among the picks this December are Christmas decorations. The store has imported LED Christmas lights designs which you won't see anywhere else except in S&R. LED lights are always the better option compared to incandescent bulb decors. Because they are packaged very nicely, they appear to be a little bit expensive compared to the latter, however, the long term savings is non-debatable. A LED bulb normally consumes 0.96 watts -- a far cry from the 5 watts power consumption of an incandescent Christmas light bulb. It lasts longer too! Click here for further details of the comparison. Other than the bright Christmas lights, S&R Club Pricing tags are also on colorful cookie and cake jars, huge Santa stockings, and some Christmas tree ornaments. There are lanterns, ribbons, and snowman too! But, hey! 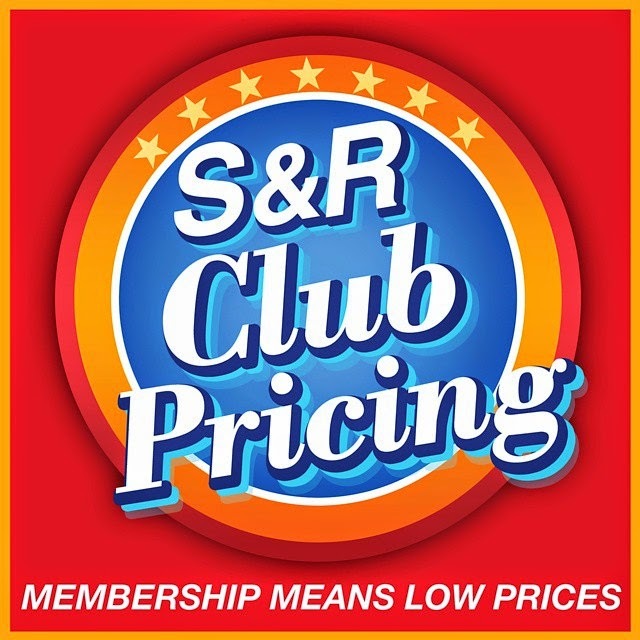 S&R Club Pricing is not only on Christmas items. You can find the same tags on regular electric coffee makers, microwave oven, and air coolers too --- all potential gift items for our love ones this Christmas time. View the complete catalog here. Why wait and suffer at long lines at groceries or malls when you can be shopping where you enjoy privileges and you are a priority. If you are already a member, pay S&R membership Shopping a visit today. 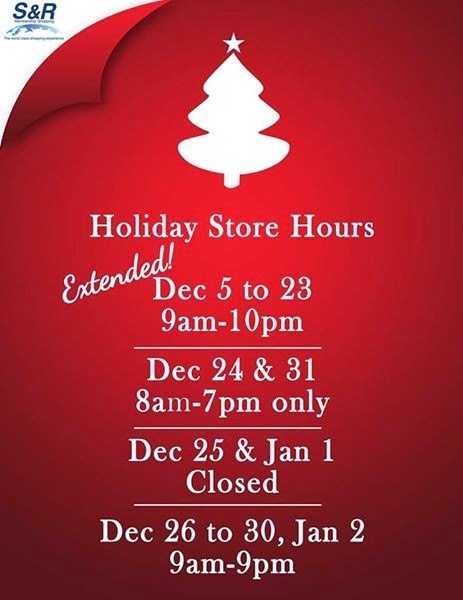 The store is open for extended hours this December (see photo below for details). Remember at S&R "membership means low prices". Not yet a member? Don't worry. It's easy. All you need is a valid ID, a filled out membership form (available in S&R's membership section), and membership fee. Get your card in less than 15 minutes. Trust me. I just became a member myself. Note: All images were sourced from both the home site and the FB page. Sometimes people just rise to get a quickie. Nah! You are taking the wrong route my friend. It ain't what you are thinking. What I mean is when you live independently (meaning away from family), maybe to work, or even study, it takes heaps of self motivation to rise up and fix your own meal. I go lazy at times and the thought of cooking just sinks me back to bed. It isn't always, but, I am just saying it does get to me sometimes. The remedy? Fastfood hunting. Now this is tricky. 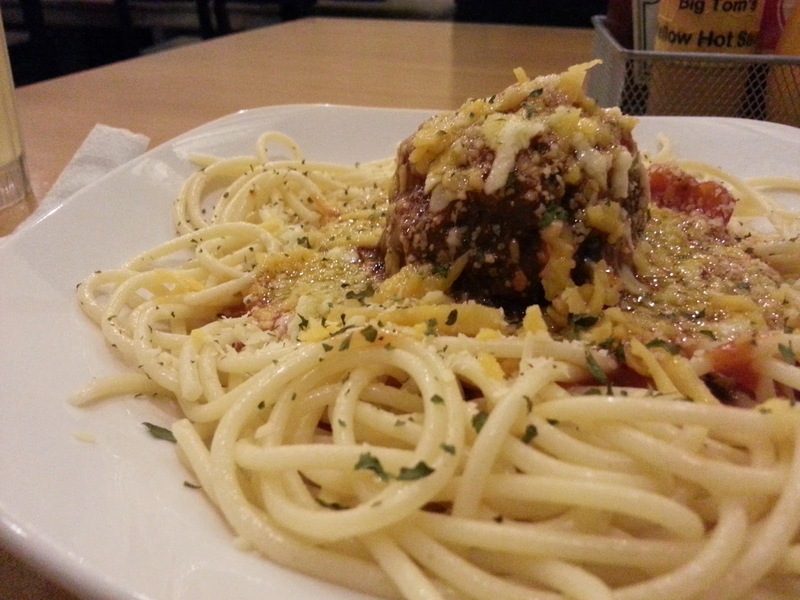 You think because you are ordering spaghetti or a hamburger, they will cook the fastest in food shops. But it isn't always the case. At least not in these shops. I went to Ice Giants a couple of times this month. At one time, I ordered the Black Forest parfait and a hamburger meal. Like anyone would, I pushed aside my anticipation for the parfait as I thought desserts are served last. I was surprised it got served first after waiting for a good 10 mins. Now, I love ice creams so I went from a spoonful to another and the refreshing feel of cold desserts in your mouth never fail to lighten the mood. 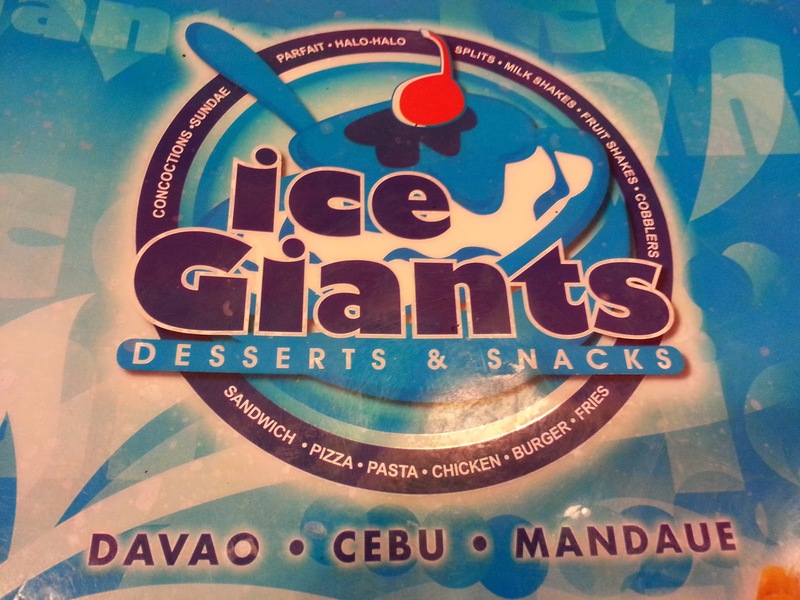 I've tasted other vanilla ice creams though and I must say, this kinda fell a little in comparison to the ice cream shop we have in Negros or the one in Ice Castle. I gave it a thought and decided, maybe it was their own creation. So I dismissed my judgement as I always have high regard for original recipes. Despite that, however, I asked. 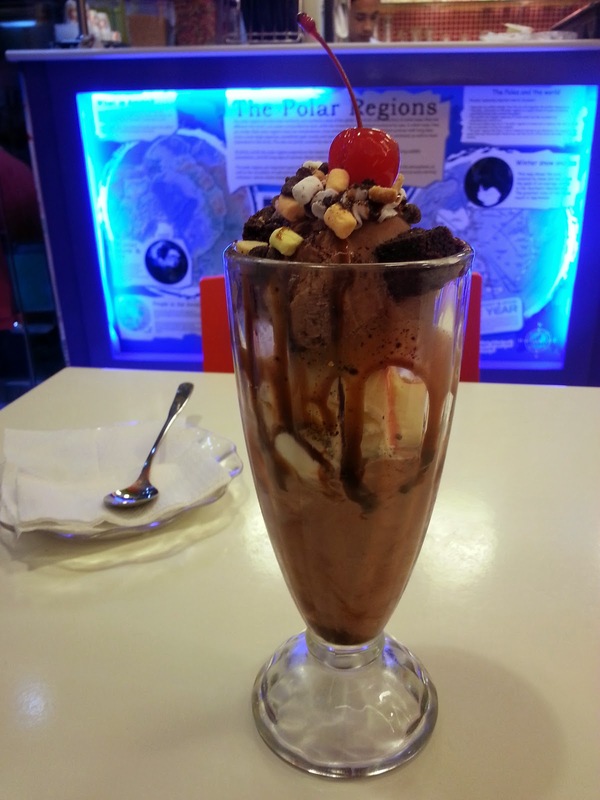 Then it sunk my heart again to learn it was in fact a commercial ice cream of Selecta's competitor. 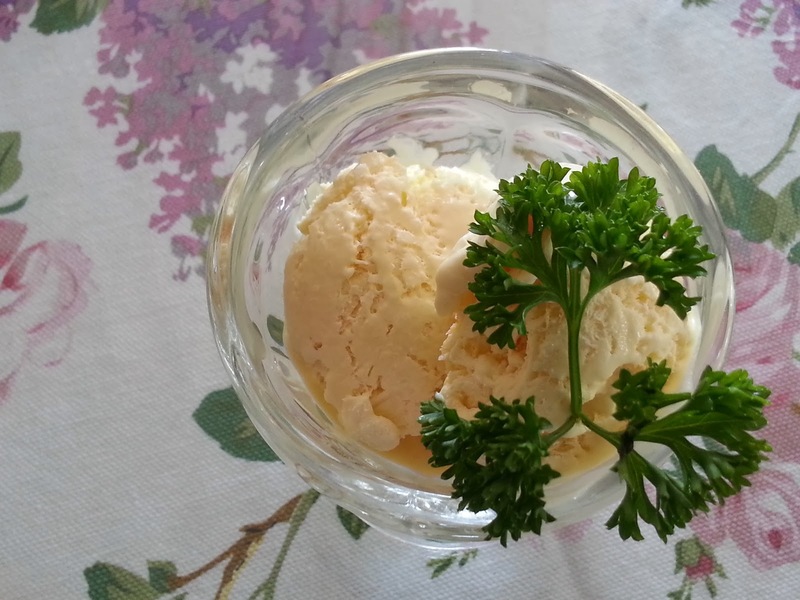 After years of tasting this type of sorbet, I've loved Selecta's texture and its creamy, rich flavor. Since then I am biased but not absolutely exclusive. Finally, I am ready for my Hamburger meal. I read the newspaper...then flipped on their menu... then played with my cellular phone. From time to time, I glanced and made sure I made eye contact with a crew as if to remind them I still have a pending order. I swear the imaginary tick-tocking of the clock is becoming louder as I hang on in patience. 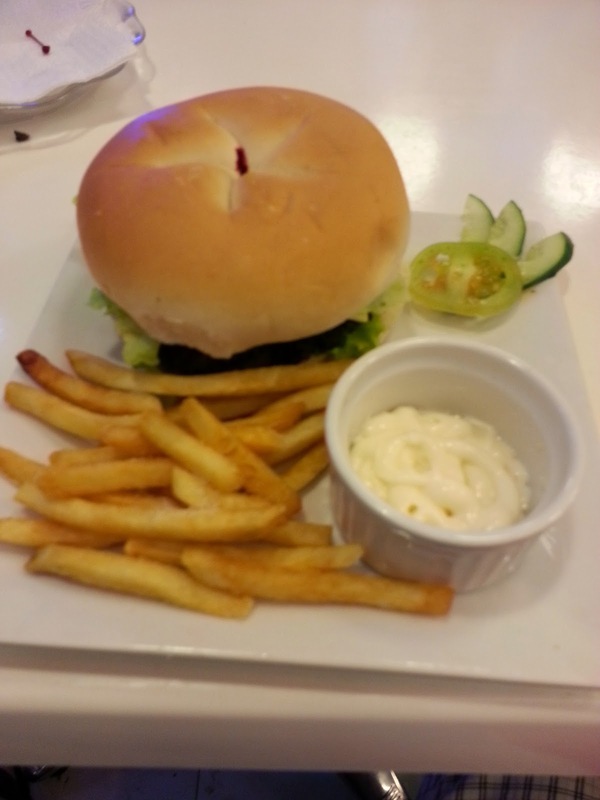 Over half an hour, then, at last, my hamburger and potato fries. The presentation was neat and looked beautiful but bland and tasteless. I'm sure it must've been delicious but I realized my taste sense was already numbed after finishing a tall glass of ice cream I got served with ahead. If there was a take-away for me in this experience, it should be that desserts must always come at the end of a meal. The second time I visited the place, waiting time was worse. If I must cite what the franchise is strongly convincing at, it would be their variety of menu items and their inviting ambiance. You see, when you think of ice cream, you think of "happy". 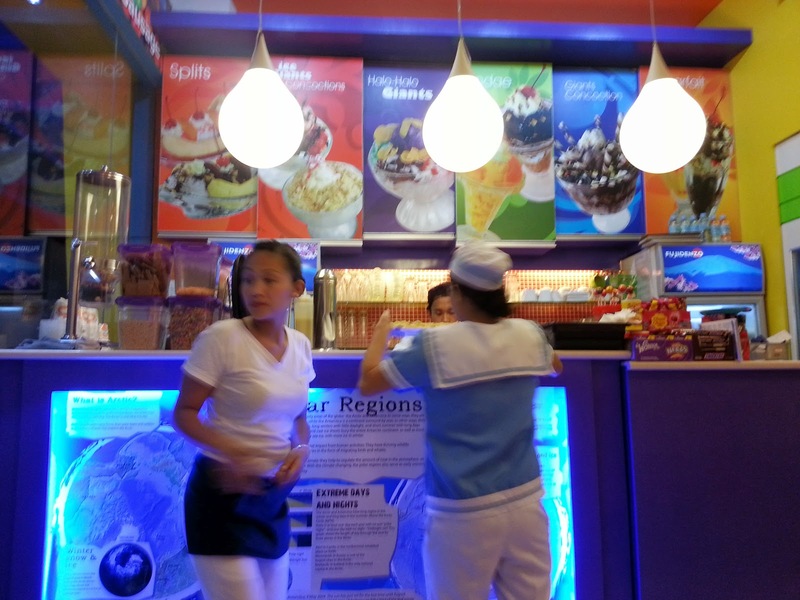 Their bright blue wall colors, huge wallpapers and pictures of desserts, their crew's sailor uniform, cool brand name and bright lights make an effectively brilliant appeal to the customers -- a happy pill. As if I deserved a bonus for good work, I arose for another quick fix. This time at Big Tom's which is famous for its hamburgers. I marched to the store to claim my incentive after a long day of office work with mind initially made up for that burger patty. 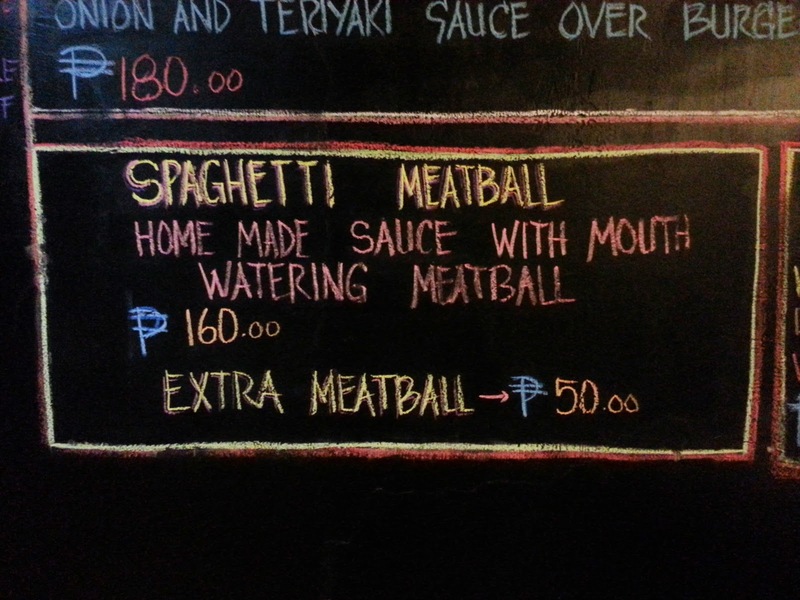 As soon as I entered the shop, the chalk-drawn sign on a black wall caught my attention "Spaghetti Meatball". Now, the only real deal I tasted was in Italiannis a very long time ago. 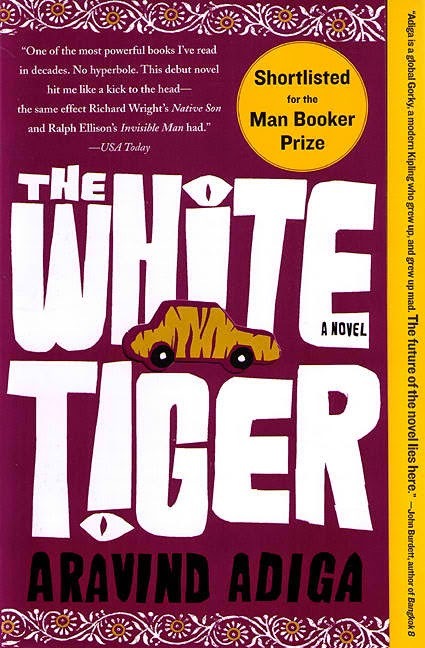 I figured, it is time I dig into it again. Twenty minutes and then it came. Served on a white plate, the pasta looked great, wetted at the center with spaghetti sauce and tiny chunks of real tomato. 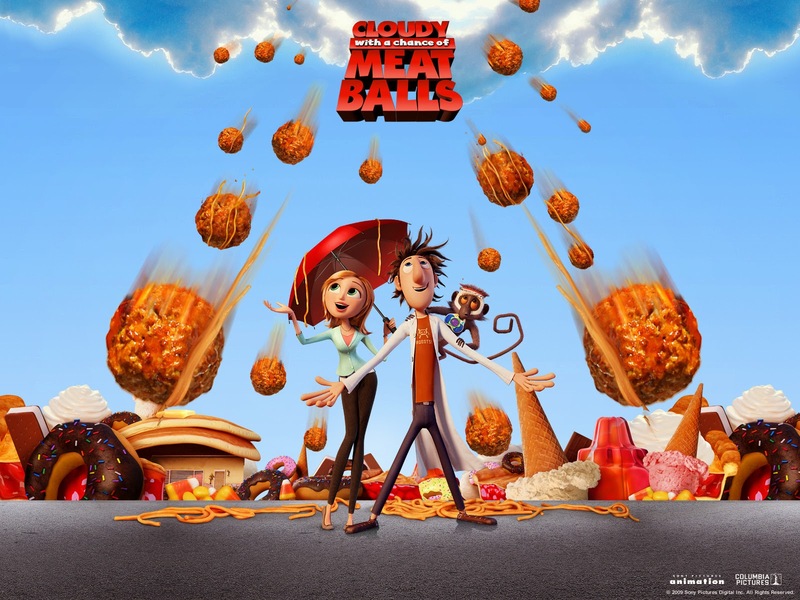 Sitting on top was the glorious meatball drizzled with just the right amount of parmesan cheese scrapings.The feeling was like being Flint in Sony Pictures animation of Cloudy with a Chance of Meatballs without the audio track. Geezz.. i cut through the meat with my knife and a fork and enjoyed the pasta to the last string. I think Big Tom's was certainly trying to serve it as Italian as possible, hence, the absence of the sweet Filipino taste. It is always good to know the difference so you can quickly toggle perspectives in both taste preferences. The basil (or so I think) in the meatball certainly made a difference, although, I imagined if it was flattened, it would have made a good burger patty too. Now that I have reached the end of this article, I realize that fastfoods are not solely defined by the food they serve. You could be ordering siomai for take-out because you are in a hurry, but if the kitchen crew prepares it from scratch and steams it in front of you until it's cooked, you stepped into the wrong shop. They make you wait because they want to serve it fresh. Here is a caveat: You are always who you are in control of. 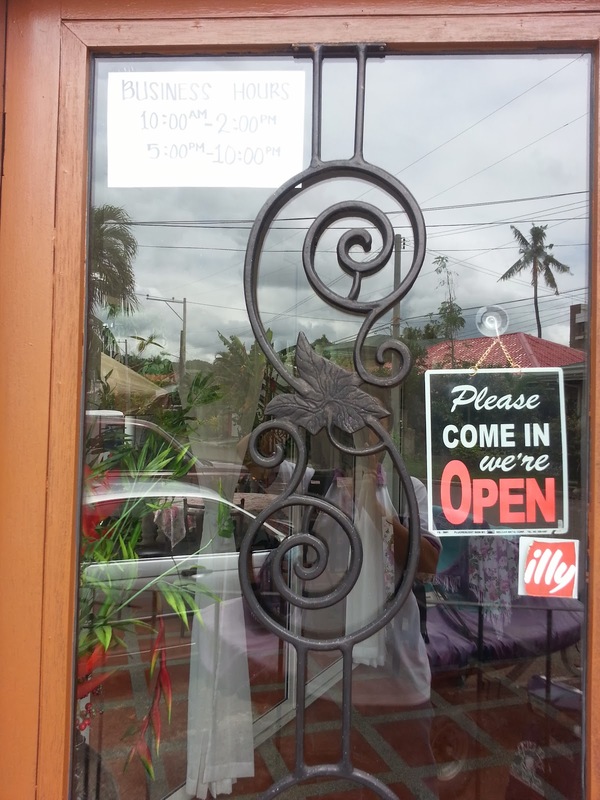 Get familiar with the shops you visit and know how they do service. Then, you can decide which to sacrifice: Time or Quality. If you chance on a shop that does well on both, tell me about it. Tipping brought me back to Sto. Nino Subdivision. 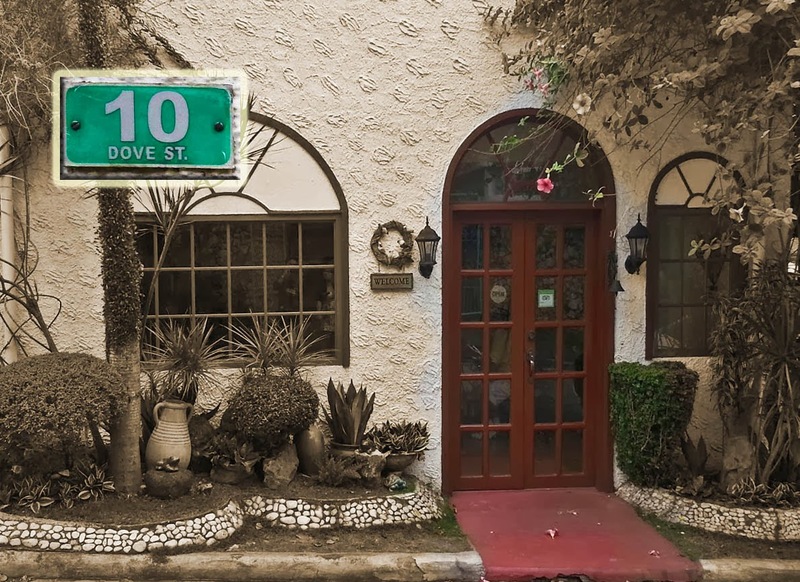 Jade, a friend who lived in the neighborhood when we were then colleagues, recently left a comment on Facebook and mentioned that other than 10 Dove St., she also frequented Cul de Sac in the same vicinity. Her fond recollection of the place sent me googling for articles and images. 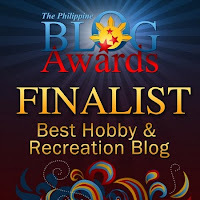 Soon enough, a schedule was set and together with hungry companions, we headed off to the subdivision. At the entrance, the guard will tell you "turn right at the first curb". Cul-de-Sac sits right at the "dead end" which, by the way, defines its very name. After stopping to take a picture, we entered into the shop. Inside, you will notice around 7 tables. Behind the glass wall from the inside, lines another row of tables for customers who prefer natural ventilation. At the bar, stands a staff who stays ready to take customer orders. 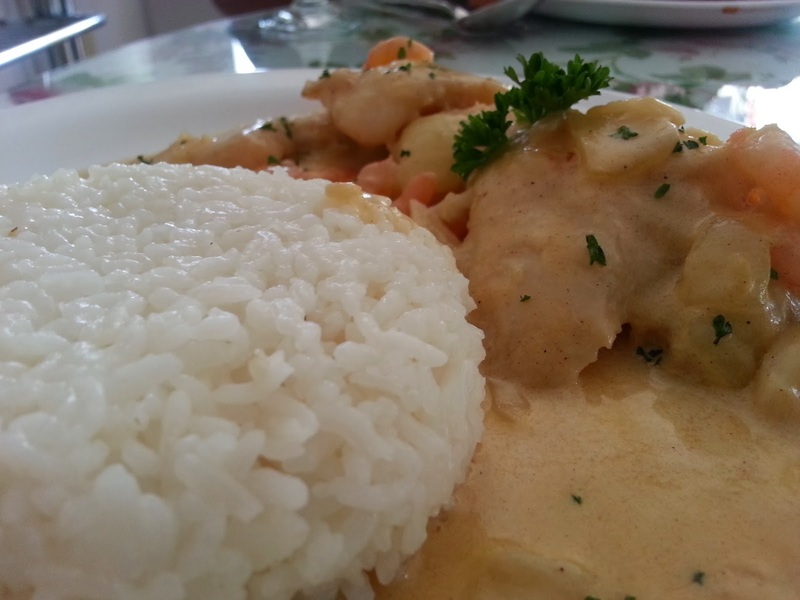 For our menu, we ordered Osso Bucco, Fish fillet in Lemon, Fish nuggets in Tartar Dip and Rhapsody in Blue. We sided our orders with Spicy Tuna Aglio Olio just to satisfy curiosity. 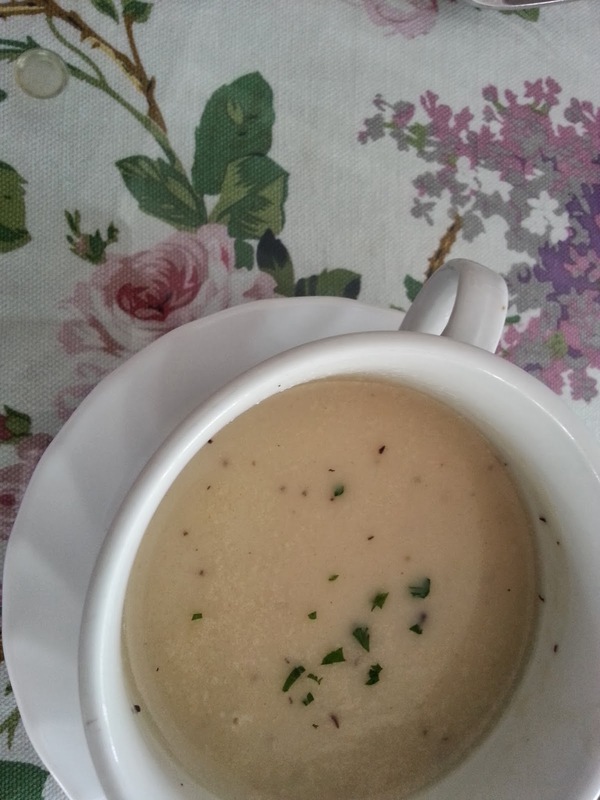 Fifteen minutes passed, then, came the creamy mushroom soup. It was delightful as it had the right amount of salt, but it didn't come as creamy as I thought it would. Ten minutes later, the main dishes started coming in. Rhapsody in Blue looked very much like my fish nuggets that i almost screamed "it's mine!" (thanks to the waiter who clearly pronounced it's name). The only apparent difference, I must say, is that the the former had lavish sauce poured all over it while mine came with a separate tartar dip. 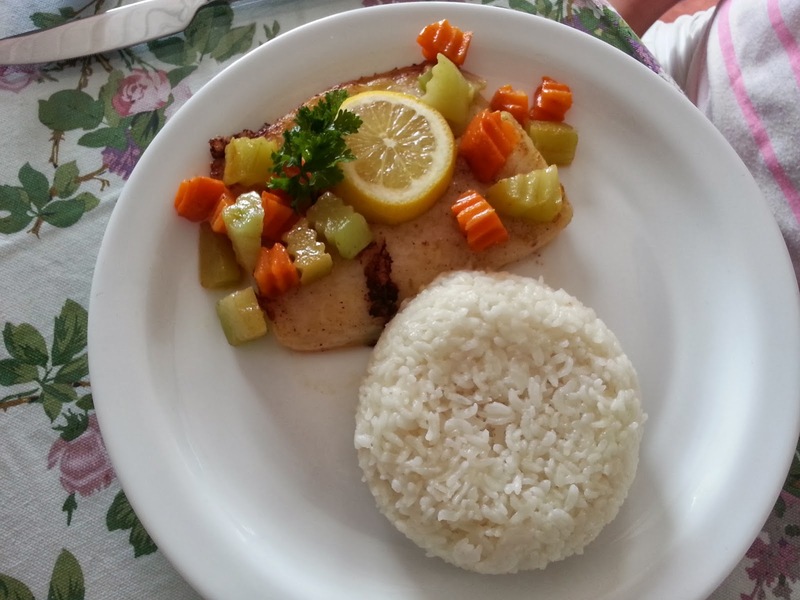 Nonetheless, both plus the Fish Fillet in Lemon, are similar in the sense that all three seemed to use the same type of fish (possibly a Dover Sole or Cream Dory) for a main ingredient. 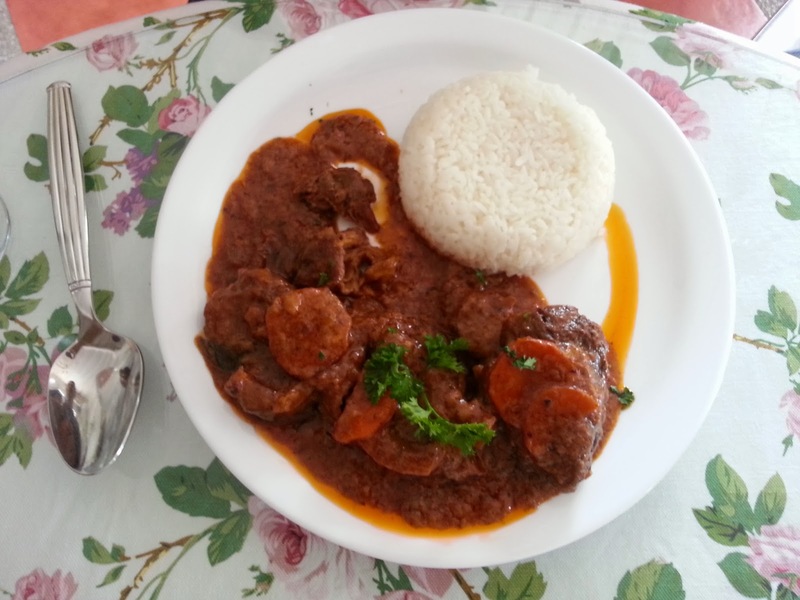 Osso Bucco, the only item that wasn't fish in our orders looked and tasted nice too. I just wonder if it would taste better had it been a cut from the prime part of the beef shank rather than being just a cutlet from the smaller portion of the bone. I know how the marrow tastes and that oily substance form the bone cavity makes so much difference and would have boosted the flavor of the starchy beef stock. Just when everyone's done with the main course, the dessert was served. It was a scoop of flaky mango ice cream. It must have melted at some point and then frozen again, hence, the separation of water from the mix. It took us over an hour to finish all three meal courses. All for the price of P200. Service was okay especially that we had the crew monopolized as we were the only ones in the restaurant then. Will I go back? Why not? Like my friend Jade, it's a dead end (cul-de-sac) I wouldn't mind finding myself in once or twice in this lifetime. Tip: Spy on a nearby restaurant in the same village. Click here. Extra: Know how Dimsum Break is linked to Cul-de-Sac. The taxi stopped at the guardhouse. "10 Dove St.", we answered when the security person asked. Smiling, we waited while the driver took us a few right and left turns until the final halt in front of the door of a subdivision home. It's funny how intrusive I felt opening the door of an unfamiliar house. However, as soon as we went in, the mood changed. It was in fact indeed a tiny restaurant with tables, chairs, and diners happily chomping. There were just about 5 tables fit in a small area that is barely comfortable for 30 people. 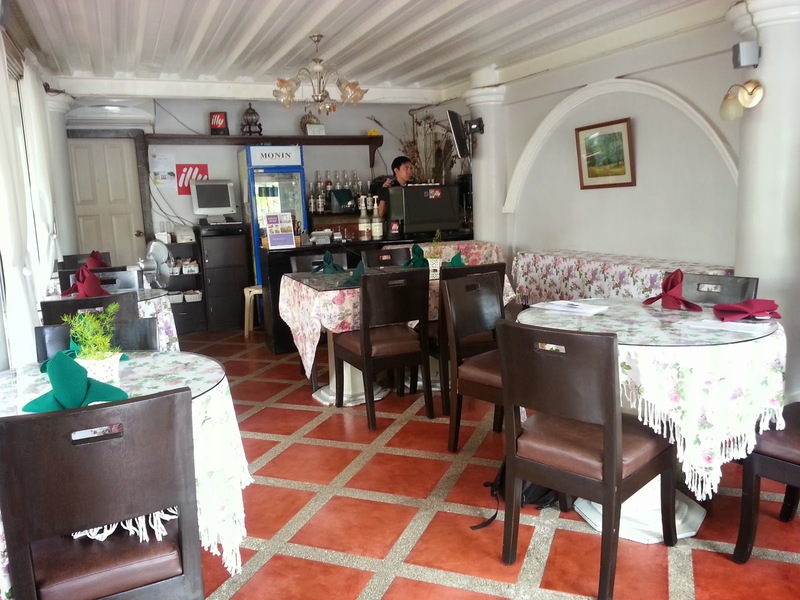 At a tiny corner, almost pushed to the wall, is a bar for a crew of two: a butler (older guy) who sometimes wait on tables wearing what looked like the modern short-sleeved barong and a full-time waiter who always looked busy as if the butler's eyes are on him all the time. Soon enough, the man in-charge came to us with a notepad and a pen. At P220 I had to complete the task of choosing my seemingly 4-course meal starting with the soup, salad, sandwich and then a cake for dessert. 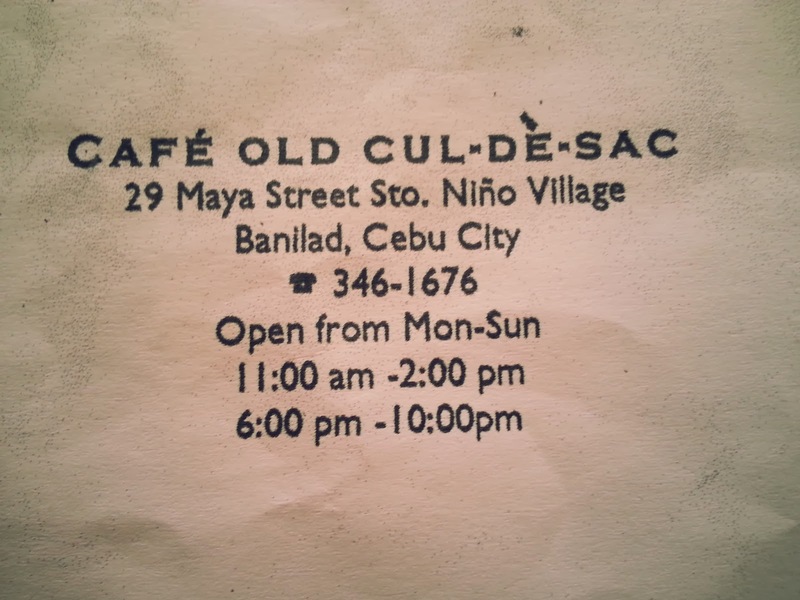 I ordered my first onion soup, shrimp salad, a hamburger and a slice of their chiffon cake. 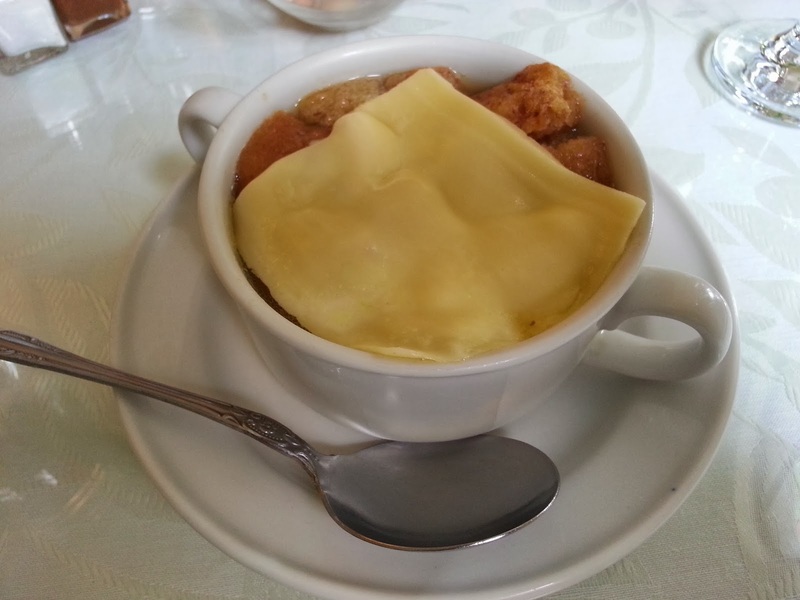 15 minutes and the onion soup was served. I hardly had the strength to pick my spoon up as I imagined how awful onions must taste being the only main ingredient in a stew. Yet, I did. How could I not? It looked meaty with a slice of cheese on top. I dug my spoon to find croutons instead of meat. Surprised, yet, I went one spoonful to another. And still another. Now onion stew wasn't at all that bad. As if the waiter knew I was almost finished, he served the shrimp salad. 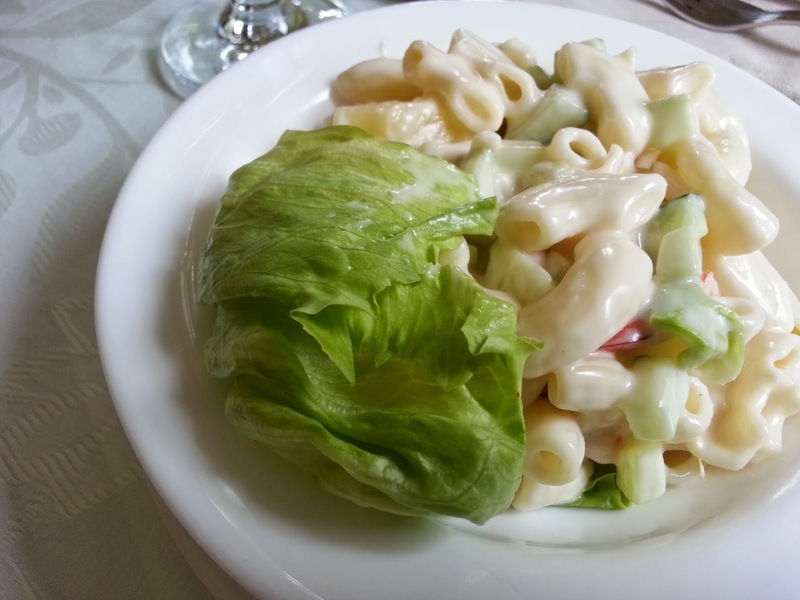 It was an elbow macaroni salad topped with a leaf or two of lettuce and mixed with skinless shrimps. At first, the shrimp didn't fit the mix, however, the more I chewed one after another in spoonfuls of macaroni, I realized it was delectable and healthy. I could eat a serving more. Third of the entrees is a hamburger. The bun looked plumped and fresh. 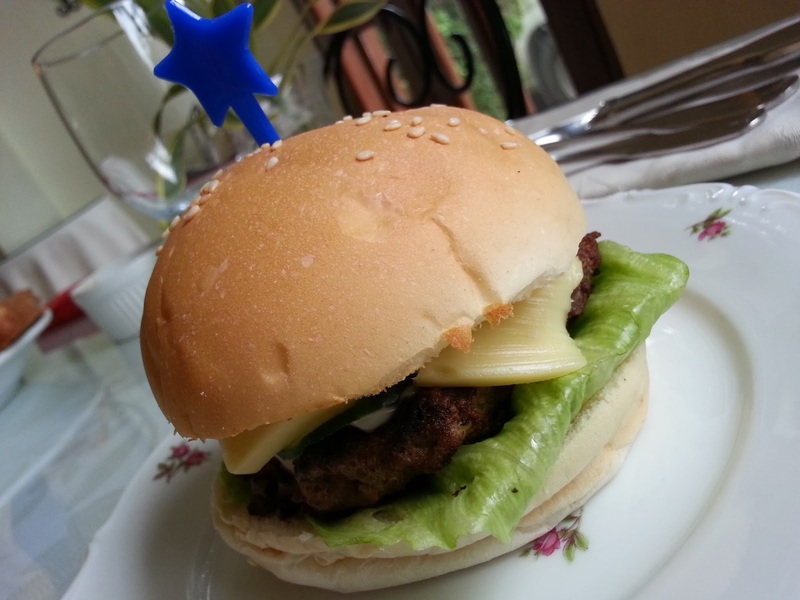 My appetite was really yearning for it the moment I smelled mayonnaise, cucumber and grilled meat patty. I am keenly familiar to the odor since I used to making my own at home too. The burger was dry at the exterior. You need to sink your teeth into the freshly cooked patty to savor the burnt meat juice and smokey flavor. I also compensated the lack of mayonnaise with catsup for its sour-sweet taste and tobasco for that lingering hot and spicy sensation. Finally, the dessert. 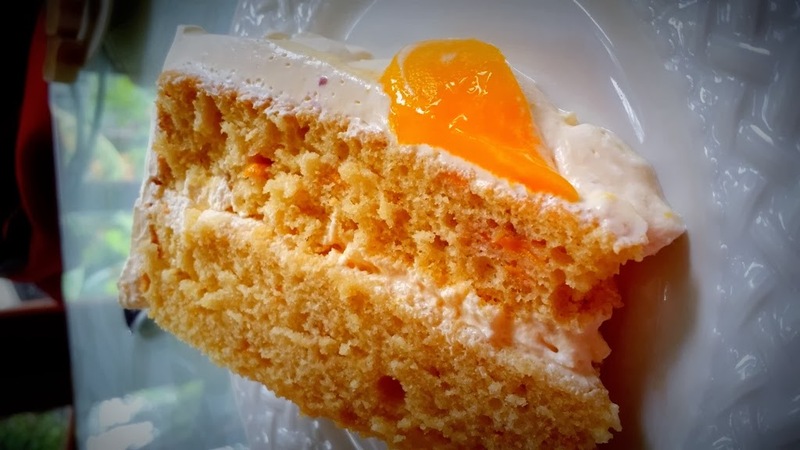 The butler mentioned three flavors and ''MANGO YOGHURT" said we, in unison. It was a full lunch and the neighborhood of Sto. Nino Subdivision was quiet and mindless of sojourners who had to walk lazily to the highway because their pockets are empty and can hardly pay for another taxi ride. Home is where doves come back to even after distances of travel. 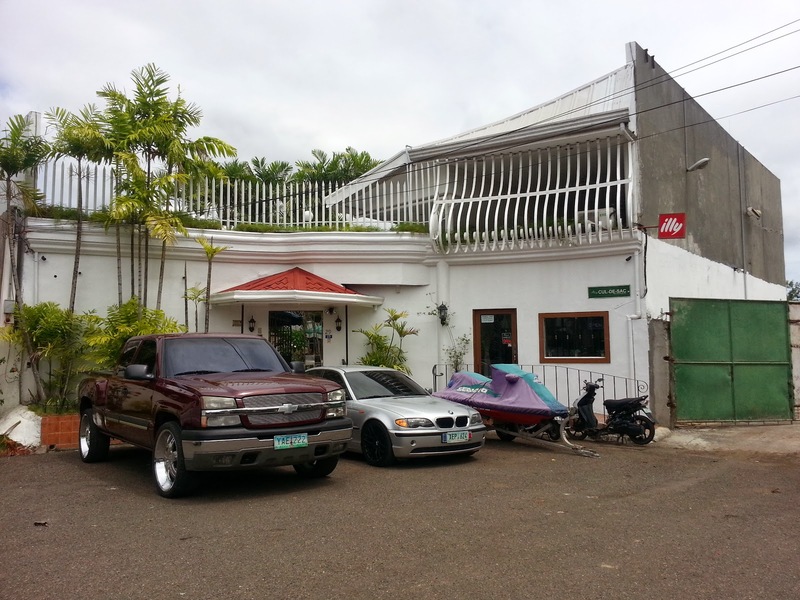 No wonder people find 10 Dove St a place to return to in Cebu.